Below is a diagram of both the major decisions and minutiae that these targets describe. Will a commitment address multiple commodity liabilities or only one? Will it apply to some product lines or all of a company's brands, and will the commitment extend to its suppliers? A company also often acknowledges the intended ecological stringency of its target. Common goals are "zero deforestation" (no deforestation anywhere) or "zero net deforestation" (e.g. forest loss might occur, but offset by restoration). In most but not all cases, companies specify timetables to achieve their commitments ("time-bound" commitments), bookended by baseline and target dates and possible interim milestones. They may also strengthen their pledge by committing to additional environmental or social criteria that go above and beyond certification requirements. 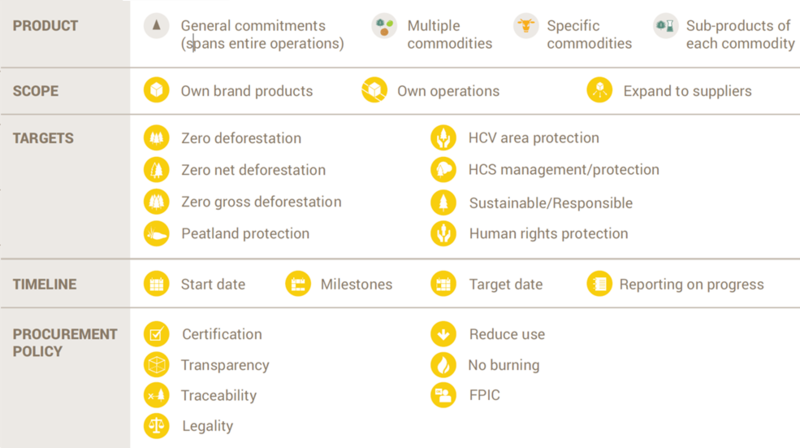 This project identifies and tracks several approaches to commitment achievement that are typical across commodity types ï¿½ from promises to source only certified commodities to no expansion into peat lands, to social commitments such as the requirement to obtain Free, Prior, and Informed Consent from affected communities. Signifies that a company has made a commitment or policy to reduce deforestation that is not specific to one commodity. Such commitments either cover all their agricultural inputs purchased without mentioning any specific commodities, or specific commitments to multiple commodities. In the latter case we included commodity-specific commitments as separate entries. Signifies that a company has a commitment, policy, or set of procurement guidelines specific to oil palm and related products, including palm fruit, palm oil, palm kernel oil and / or derivatives. Signifies that a company has a commitment, policy, or set of procurement guidelines specific to soy / soya and related products, including soy oil, soy meal and / or soy derivatives. Signifies that a company has a commitment, policy, or set of procurement guidelines specific to wood products, including timber, pulp, paper, packaging, biomass and other inputs made from trees. Signifies that a company has a commitment, policy, or set of procurement guidelines specific to cattle products, including beef, leather, tallow, dairy or other related products. High Carbon Stock (HCS) - The High Carbon Stock (HCS) approach limits what lands can be converted to agriculture or other uses based on their carbon storage. There are two groups developing their own definitions and thresholds for High Carbon Stock. One group, called the HCS Approach group, includes civil society (Greenpeace and The Forest Trust). They defined “high carbon stock” as 35 tons of carbon per hectare in a pilot project in Kalimantan, Indonesia. The other group, known as the Sustainable Palm Oil Manifesto group, is industry-only, and is currently conducting a separate study to define high carbon stock. For more information see: http://www.greenpeace.org/international/Global/international/briefings/forests/2014/HCS%20Approach_Breifer_March2014.pdf and www.carbonstockstudy.com.